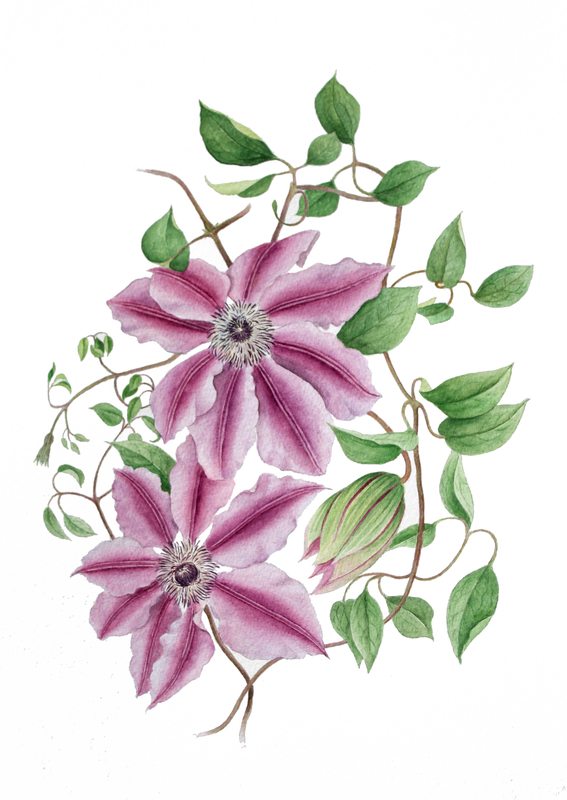 This painting of a Clematis ‘Nellie Moser’ is another of my own being exhibited at Claregalway Castle. A castle that is around 1000 years old is a wonderful setting for an exhibition of botanical art, particularly when held in conjunction with a Garden Festival. We managed to hang most of the exhibition today – so exciting to see the work of the other participating artists, all of a very high standard. Hopefully the exhibition will attract lots of interest (and buyers)! The weather is looking a bit doubtful so far – glorious sunshine early this morning, but it’s now back to more rain. Bright, sunny weather would make such a difference for the Garden Festival. This entry was posted in Uncategorized by janestark. Bookmark the permalink. This is beautiful! You are so very talented! I hope that the exhibition went well? Thank you, Helen. The opening and the first two days of the exhibition went very well, and I actually sold “Nellie Moser”! A lot of people seemed to like it. Since the first two days of the exhibition coincided with the Galway Garden Festival, we had a huge footfall, which is a great way to start! The exhibition is open until 11th August, so hopefully we shall get plenty more people visiting. Thanks, Debbie. I know what you mean – it’s a fabulous plant.